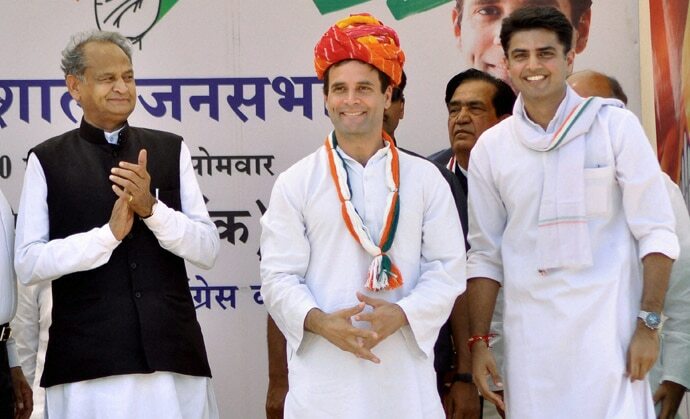 The most talked about poll talk in Rajasthan revolves around the state Congress chief Sachin Pilot, and its former chief minister Ashok Gehlot. Last week, two pictures that went viral on social media and appeared prominently in local media, too, were about them. In one photo, Pilot and Gehlot, sitting on adjoining seats, had faces turned away from each other. CP Joshi, whom the high command denied his rightful chance to be chief minister in 2008 in favour of Gehlot, was sitting behind — again with a sulking look that Pilot and Gehlot also wore. As this picture went viral, Congress quickly released another picture in which all three were happily posing as a team. On Tuesday, Pilot made another impressive photo show when he drove a motorcycle with Gehlot riding pillion. The leaders were on the way to Karauli, but traffic congestion made Pilot opt for a bike, albeit as pictures showed, without wearing a helmet. But the picture did send out the message that Pilot wanted to convey he is there to take Gehlot along despite the latter’s not-so-friendly attitude towards him. They both are candidates for chief ministership. But if Congress is in a comfortable position in the coming elections, it is primarily because of the hard work done by Pilot’s team — just as in 2008 it was because of CP Joshi’s group that the Congress won the elections. Projecting anyone else as the chief ministerial face is bound to demoralise a large chunk of party workers who relentlessly worked for four-and-a-half years when most of the claimants for the reward were staying put in their comfort zones. Pilot’s poll strategy is working well, seeing the response he has been getting at the party’s events. He also takes on the BJP well. So when CM Vasundhara Raje called him a novice, he responded by saying he was capable enough of tackling her. He even took on Amit Shah, BJP’s national president, who had been holding a series of meetings in Jaipur, saying Shah’s speeches won’t matter now because people have understood the BJP’s game and have made up their minds to vote for the Congress. Rahul Gandhi, Congress president, has been focussing on the state, too, and will be visiting Dungarpur on September 20. Even local leaders such as Jaipur-based Pratap Singh Khachariyawas says people have been coming voluntarily to support his frequent agitations The response to the bandh call against petrol prices had a mixed reaction. Although it was not as total as one would’ve expected, it did give the BJP an idea of the extent of support the Congress has been able to build within the state. The good thing about the Congress is that it is not taking anything for granted, as Pilot says he is looking at a target of 135 seats in the 200-member assembly and not a simple majority. The Congress, for record’s sake, got 21 seats in the 2013 Assembly and 96 in 2008 when it could form the government. The writer is Senior Editor, India Today. He is based in Jaipur.